The Migrators are a band from Italy that have created this interesting Rock Opera, of sorts. They are inspired by Quadrophenia. 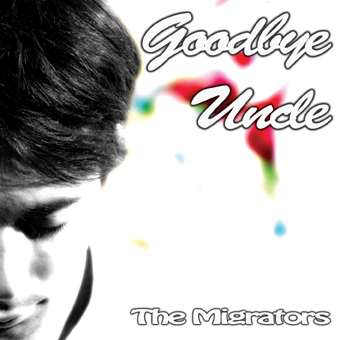 Here is what the band has to say: “Goodbye Uncle" is about the sudden, but clear realization of one person - Shiny Kid - that the city he lives in is a Rubber city. He finds out that what he has always suspected as wrong around him is actually the very existence of the Rubber. He finds out too, that the production of Rubber is a plot. Behind that plot there`s one person - Uncle - and his victims are the inhabitants of this city, who by Uncle`s deceptions become the very producers of the rubber, Uncle`s slaves, and enemy to themselves and each other - therefore Rubberons. Moreover, they don`t have a slightest idea about what is going on, or what they are actually turning into, but when Shiny Kid begins understanding the truth, he immediately sets off to tell his fellow-citizens about the amazing discovery that can set them free. How will good win over evil, where will good come from, why didn’t Shiny Kid become a Rubberon? How can Uncle be defeated ? But is the music any good, do you want to hear this? It comes with a cool booklet with a picture for each song. Actually it is quite cool. The music features both male and female vocals and the music is pretty cool psychedelic indie rock with a melodic catchy mentality but it is quite interesting. A damn fine record.